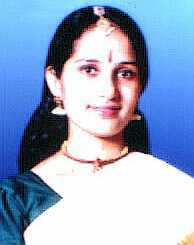 Ganga Thampi, daughter of famous Kathakali Artist Shri. Madavoor Vasudevan Nair did her Degree and Masters in English Literature from Madras University and then completed Diploma and Post Diploma in Bharatanatyam from Kalakshetra, Madras and is now lecturer of dance (Bharathanatyam) there. Ms. Ganga Thampi has played major roles in many of Kalakshetra dance dramas like Sita in Ramayanam, Saraswathi Bhai in Purandaradsa, Parvathi in Sivageethimala, Madanavalli in Krishnamari Kuravanchi, Radha in Gita Govindam, Padmavathi in Jayadeva, Parvathi in Kumara Sambhavam and Kundhi in Karna Sapatham etc. Has toured extensively with Kalakshetra to the west and all over India. Has represented Indian Art and Culture performed in South Africa Bharatha Utsav 1996. Has performed in the annual dance festivals of many prominent organisations like Nrityanjali Trust, Natyanjali Trust, Natya Arangam, Music Academy etc. She has performed at Music Academy for the inaugural function of he Annual Dance and Music festival 1997. In 1998 she participated as a judge in Kerala State Youth Festival, which is considered as Asia's biggest art festival. Choreographed a dance poem "Chintavishtayaya Sita" based on a poem written by great Malayalam poet Kumaranasan. She is a member of the Board of Studies in dance under the Faculty of Art and Social Sciences, Sree Sankaracharya University of Sanskrit. The awards she has received include 'M.G.R' award from the Music Academy, Chennai 1996 and 'Yuvakala Ratna' award from Kaladarpanam at Ernakulam, Kerala in 2001. Thiruvanmiyur, Chennai - 41, India. Kollam, Kerala - 691003, India.